Learn more about the 21'st Dynasty. 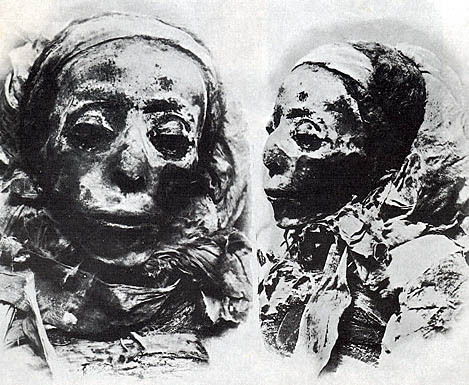 Details: The mummy of Neskhons was partly unwrapped by Gaston Maspero on June 27'th, 1886. G. E. Smith completed the unwrapping in 1906. He discovered that flowers (of an unidentified family) had been wrapped around Neskhons' big toes. Another flower on a long stem had been placed on her left foot, and another encircled her left ankle. Although Smith could not determine her age at death, he notes that Neskhons had no gray hairs and must have been relatively young when she died. Based on the swollen appearance of her stomach, Smith concluded that Neskhons had been pregnant (or in the process of giving birth) when she died. Neskhons lay in only one of her coffins (presumably the inner one, although this is not specified by Reeves.) Her other coffin was found containing the mummy of Ramesses IX. 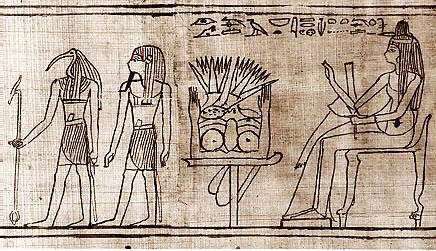 Dewachter theorizes that Ramesses IX was mistakenly put in Neskhon's coffin in DB 320 during one of the caching operations. However, since Neskhon's original burial was in DB 320 in Year 5 of Siamun (see Other Burial Data below) and occurred many years before the placement of Ramesses IX in the DB 320 cache after Year 11 of Shoshenq I (according to the dating system of Reeves), it seems unlikely that the kind of mix-up referred to by Dewachter would have occurred. Photo Credit: RM (Cairo, 1912,) pl. LXXXII. For high resolution images of Neskhons see the University of Chicago's Electronic Open Stacks copy of Smith's The Royal Mummies (Cairo, 1912,) Call #: DT57.C2 vol59, plates LXXXII. LXXXIII, LXXXIV. Recent color photos of the mummy of Neskhons may be seen at the Eternal Egypt website. Biographical data: Wife of Pinudjem II. Photo Credit: XRP (1973,) 51. For high resolution images of Isiemkheb-D see the University of Chicago's Electronic Open Stacks copy of Smith's The Royal Mummies (Cairo, 1912,) Call #: DT57.C2 vol59, plate LXXX. Photo Credit: Emile Brugsch, 1886. From MA (1958,) p. 125. For high resolution images of Nestanebtishru see the University of Chicago's Electronic Open Stacks copy of Smith's The Royal Mummies (Cairo, 1912,) Call #: DT57.C2 vol59, plates LXXXV, LXXXVI, LXXXVII, LXXXVIII. Details: The mummy of Djedptahiufankh was intact when found in DB 320, and was partly unwrapped by Maspero on June 29'th, 1886. At that time, Maspero found the figures of two serpents (made of some unspecified material) on the neck of the mummy, and also a lotus flower, which had been wrapped in the folds of linen. He also discovered a heart scarab on the mummy's chest along with a silver figure of a hawk with spread wings. Twenty years later (on Sept. 5'th, 1906) Smith removed some of the remaining bandages and discovered numerous amulets and other items of jewelry. Very thin gold rings were found on Djedptahiufankh's fingers and toes, and were probably used, in place of string, to keep gold finger and toe covers in place. Smith found many carnelian objects on the left arm: a uraeus, a serpent's head, an Ab amulet, a lotus bud, a barrel-shaped object, and an object of unknown significance shaped somewhat like the letter "Y." 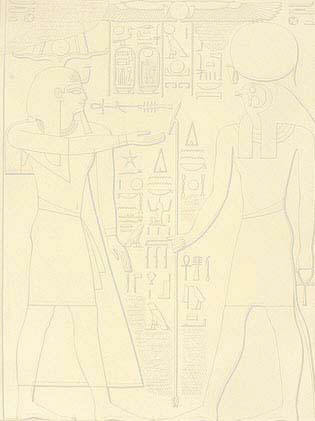 In some manner attached to these, Smith also found a scarab and a wedjet made of a mottled black and white stone; two lotus buds, another scarab, and a djed amulet made of light green stone; a broken object of undetermined significance; and a "boomerang"-shaped object with a figure of Thoth engraved upon it. The embalming plate had been fashioned out of a copper alloy material, identified by Smith as bronze, and had the usual wedjet fashioned on it in raised relief. 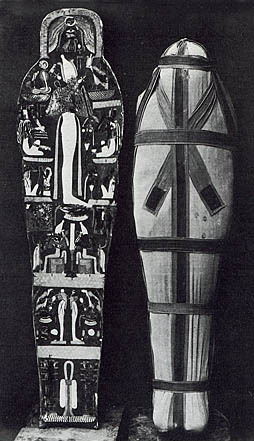 Djedptahiufankh's mummy lay in a double coffin set (CG 61026) which had originally belonged to an individual named Nesshuenopet. The coffin board had also originally belonged to another person whose identity is unspecified. The outermost coffin had its gilded left hand missing. Otherwise, the coffins and coffin board were intact. Photo Credit: RM (Cairo, 1912,) pl. LXXXIX. For high resolution images of Djedptahiufankh see the University of Chicago's Electronic Open Stacks copy of Smith's The Royal Mummies (Cairo, 1912,) Call #: DT57.C2 vol59, plates LXXXIX, XC, XCI, XCII, XCIII (for close up of jewelry on wrist.) Recent color photos of Djedptahiufankh's mummy may be seen at the Eternal Egypt website. 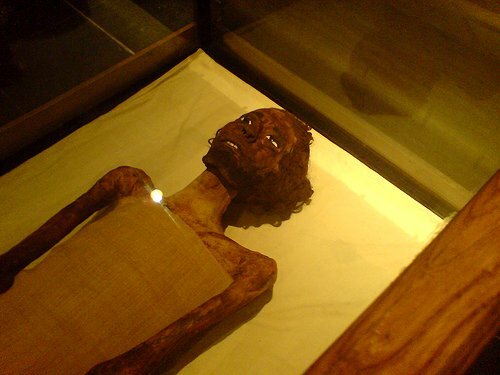 See Flickr member dustinkeirstead's color photo of Djedptahiufankh's mummy as it appears today in the Royal Mummy Room of the Egyptian Museum in Cairo.